Inspired by the incredible true story of Sir William Hillary and the founding of the Royal National Lifeboat Institution, Storm Survivors continues the story of its popular prequel, Storm Warriors. Set in the days of storm and sail in the 1800s, it’s a riches-to-rags story of a real-life visionary who puts everything on the line in service to a passionate call. Ultimately, his cost-me-everything sacrifice doesn’t seem to balance with the meager outcomes. Or does it?This action-studded, romance-laced novel inspires readers to see the silver lining in every set of hopeless circumstances, and opens minds to reconsider what really defines success. 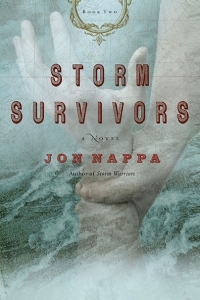 In 2007, NavPress published Storm Warriors, the original historical fiction novel first written by Nappa. It went well and resulted in the founding of an International not-for-profit organization (Storm Warriors International) devoted to inspiring people to get involved rescuing others. The original book was based on true-life rescues in the 1800s and the invention of the first unsinkable lifeboat in England. It remains a popular and exciting read enjoyed by numerous and avid readers today, but is also appreciated by a growing number of people who are inspired by humanitarian themes and works. The book indeed prompts a larger question: What does it take for anyone to risk his or her life for others? NavPress requested a second lifeboat-themed book although Nappa had not originally planned for one. He ultimately agreed and after further research, settled on a story that followed the era when the first English lifeboat had been invented. The new story, originally entitled, With Hearts Courageous, took place on the Isle of Man but was later renamed, Storm Survivors. These days, both books have been released by N.I.P.I. and Storm Warriors International Press. The two books are often packaged together, and entitled, The Storm Set. However, Storm Survivors succeeds as a stand alone novel loaded with sea-rescuing action, life-saving inspiration, and period romance. Both books continue to draw new readers and cultivate ongoing interest in the charitable work of Storm Warriors International. You can find out more about the not-for-profit organization at stormwarriors.org and may track other updates on this site by looking for the Storm Warriors tag on any of the pages or posts.